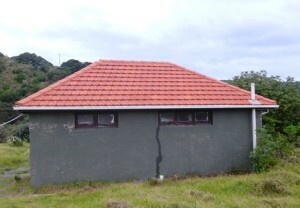 The women’s ablution block at North Piha Campers Club is sporting a bright new Marseilles tile roof. The old tiles were leaking, and theÂ Campers Club, which runs the membership only campground, was asked by the Waitakere Ranges Local BoardÂ (managersÂ of Les Waygood Park), whether it wanted a new long-run steel roof or a replacement Marseilles tile roof. The Campers Club opted for heritage and chose the Marseilles tiles which were fortuitously the same cost as steel roofing. There are still a few companies that make these tiles in New Zealand including Monier tiles. Marseilles tiles originated in France and are made from clay, moulded to their distinctive profile in a press. In New Zealand, production of these tiles began in 1901, though they were imported into New Zealand prior to this. It seems likely that the old tiles would have been made by Winstones, as Les WaygoodÂ whose bach was across North Piha Road and who founded the Campers’ Club, was an engineer at Winstones. Winstones began making the tiles in 1920 and had plants near clay deposits in Taumaranui and Plimmerton. The tiles are distinctive not just for their profile, but for their bright orange terracotta colour.